Are these legal mailing size envelopes as well? Making sure your coins are out of reach from the kids but also easy to spot on that cluttered desk of yours (whether in the office or at home) is as simple as grabbing one of our Green #6 Coin Envelopes. The vibrant Ultra Lime color will make certain that people see the color and love the color. Great to brighten up your work desk or give you smile at home after a long day at work. 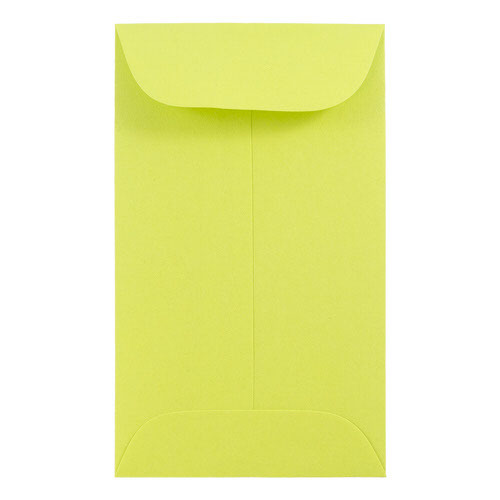 This envelope is perfect for storing coins, stamps, even valuable rings! The gum closure will ensure your contents' safety and make you less worried when you leave it for a few. Green #6 Coin Envelopes measure in at 3 3/8 x 6 inches. Available in Ultra Lime! Love the size but want another color? Or love the color and need another size? Check under 'Other JAM'n Products You Might Like' to see a variety of sizes and a variety of colors!